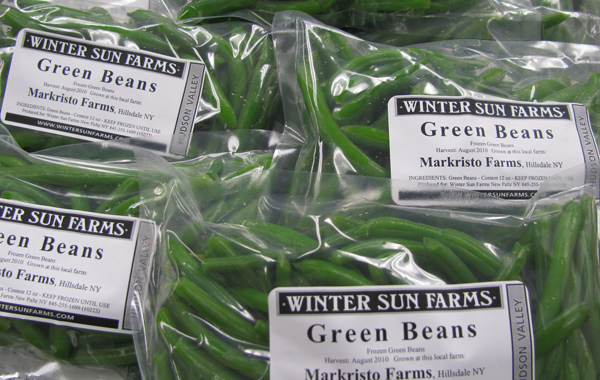 The Philadelphia branch of New Paltz, N.Y.-based Winter Sun Farms aims to remedy that situation by providing frozen vegetables and fruit sourced from farms in New York’s Hudson Valley. Founded in 2006 by Jim Hyland, Winter Sun Farms now boasts nearly 2,800 members between three New York locations and one in Western North Carolina. Entering their initial season, Bucks County’s Adam and Sara Gordon aim to sell 250 shares. Their season stretches from December to April, catering to members of summer/fall CSAs, which traditionally run from May to November. With so many farms in Pennsylvania to choose from, the number one question that the Gordons routinely face is, naturally, why New York? “It’s purely because this region, like many, many regions in the country, lack local food processing plants,” explains Sara. And those that do exist, she continues, cater to high-quantity producers. While they hope to affect a change in coming years, for now all of the food is purchased in season and frozen using IQF (Individually Quick Frozen) technology in Kingston, N.Y. This season’s participants can expect to receive a variety of fruits and vegetables, including heirloom tomatoes, peppers, kale, edamame, and berries, like raspberries and blueberries. Each share will also have a fresh, locally sourced fruit or vegetable. For more information about Winter Sun Farms in the Greater Philadelphia area, visit wintersunfarmsgp.com.